The word 'Chakra' is a sanskrit (ancient indian language) word, which means 'wheel'. This wheel like object is a spinning electromagnetic energy vortex which is connected to different parts of our physical body, mind and emotions. Every chakra resonates with an electromagnetic frequency. Every human being (perhaps every being) has got this energy centers. Also light and color (which means the same) have an electromagnetic frequency. If we would send a sunlight ray through a prism and hold a blank sheet of paper in front of it, we would see the whole color range on the paper (except infrared and ultra violet, which we can't see with our eyes) in seven colors. Red, orange, yellow, green, blue, indigo and violet. Without our sunlight we wouldn't exist. As soon as we enter a lightful place, these light rays are hitting our body. The light gets absorbed by our skin and our optic nerves in the eyes. Because we exist in the material universe, we were always exposed light. With the according 'color' or frequency of this emitted electromagnetic wave storm, we are able to stimulate our energy centers, the Chakras. If you spend much time in a red painted room with red decoration for example, you would stimulate your red chakra (Root Chakra). This would lead you to more physical activity (e.g. desiring sports, craft work). A fruit or vegetable with the color of one chakra absorbed the sunlight since it's growth starting point. After eating this fruit/vegetable or drinking it's juice your body starts to absorb this energy too. 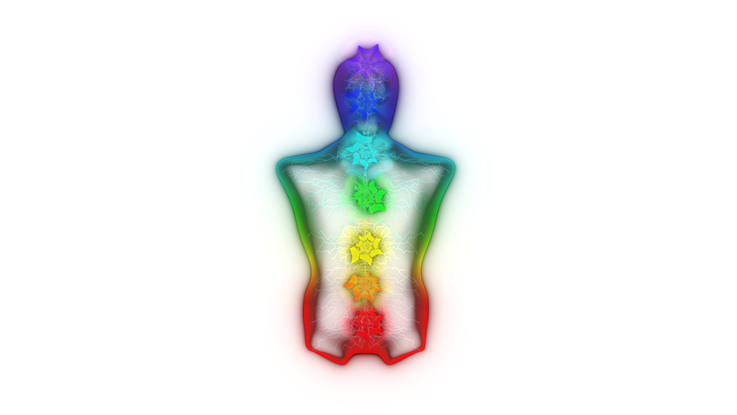 By stimulating a chakra with a 'low' charge, you are able to increase it's energy, or the spiral inflow of the electromagnetic frequency to heal the chakras according organs, mind parts or emotional imbalances. From electromagnetic color frequency, transposed to solfeggio sound frequencies, chakras would also get stimulated by listening to them (especially with speakers). The offered program Transcendental Source comes with information of how to stimulate each chakra, as well as a chakra stimulator which contains appropriate solfeggio sound frequencies and suitable music.